The campaign is coming up and its coming quickly. Blogging has become the new medium for getting the message out and, more importantly, getting it past the filter. At the beginning of this year, I co-founded Blogging Tories, a grassroots organization of Conservative Party supporters that do not hesitate to express their opinions, point out media bias, and hold the Liberals and the NDP to account. They do this without compensation and thus their message comes from the strength of their beliefs. Blogging Tories is the case-study of grassroots activism. In fact, as I have noted before, there seems to be more Canadian conservative-minded bloggers in the ‘blogosphere’ than there are on the left. The conclusion that I have derived is that conservative opinion is stifled by the mainstream media and has not generally been heard. Blogging has given a voice to those without one in traditional media and now these voices are being heard. Most recently, members of the Blogging Tories were instrumental in forcing the lid off of the Jean Brault testimony as Judge Gomery has now realized that publication bans cannot exist in the modern media climate; they cannot exist in the modern media climate that we have defined. Indeed, since this shift in media delivery after the advent of blogs, laws and unjust laws are being redefined concerning personal and press freedoms. The 2004 Presidential election campaign witnessed the first election in world history which exploited the potential of blogs to the fullest extent. From the automatic organization of neighbourhood parties for Bush to Meetups for Kerry, the blogging phenomenon enabled the American political class to appeal to the grassroots for help in delivering their the message. The Conservative Party of Canada needs the blogosphere to deliver its message. In fact, citizens need the blogosphere to bypass the CBC, CTV and other mainstream media outlets to vent their anger and express their hope for change to their countrymen. While the CBC asks Canadians if they want an election right now (Liberal talking point), the blogosphere allows Canadians to tell each other that they don’t want an American style 10 month election campaign (Conservative talking point). If you question the power of blogging in political campaigns, Google “Conservative Party of Canada” and check me out. I’m the 7th result as of the time of this post, and my name is the first person’s name that appears. And I’m not even running. Maybe I should. I received this note today from Chris Taylor (no relation). His riding EDA wrote up this piece for a newsletter that was distributed to the membership. Nods like this are quite encouraging. Now the above sounds more like something gooey than something electronic, doesn’t it? But it could be the most important development among conservative grassroots in North America since the first tavern was built! You all know about the Internet, and the World Wide Web. Well, a “blog” (short for “weblog”) is just another kind of website, programmed to make it very simple to publish one’s thoughts and photographs as one comes up with them. An online diary or “log”, in some cases, and commentary about current events in others. A few go so far as to provide political or philosophical commentary, and among those “bloggers” conservatives seem to be in the majority! Taken all together, they are referred to as the “blogosphere”. And there you have it. A way to get around the so-called liberal monopoly in the news media, or better still, to hold them to account. Each blog lists a “blogroll” of the author’s favourite blogs, and thus the best of them are all connected to one another in a virtual web of excellence. The best bloggers, who publish clear and thoughtful posts daily or even more often, are viewed by thousands of, including many journalists. It takes dedication, and there is no reward but honour from your peers — but is that not true of all grassroots activism? In fact, some Conservative Members of Parliament, including Monte Solberg and Stephen Fletcher, have blogs on their own websites. And there you will see a refreshing frankness and spontenaiety found nowhere else in politics. Many if not most of the conservative blogs in Canada are listed by BloggingTories.ca. Some of the best bloggers in Canada belong to the ring of Red Ensign Blogs, like Stephen Taylor (whose statistical research is awesome). Some are self-named, like Stephen Taylor’s, while others have way-over-the-top names like Shiny Happy Gulag. Many are thoughtful and funny, some are outrageous, and most of them will make you think. And if you think something has been left unsaid, or that there is a niche unfilled in the “blogosphere”, then you can easily start your own blog, either by registering at blogger.com or by downloading blog software for your own website from wordpress.org. With daily dedication and thoughtfulness you can be famous too! Deciding to exit politics by personal choice rather than that of the electorate, which was sure to come in the next General Election, Le Devoir reports that Pierre Pettigrew is planning to leave the federal scene for potential headship at the Organization of American States. As I speculated earlier, Pettigrew is one of the most vulnerable Liberals in caucus given his meager margin of victory during last year’s election. He beat the Bloc candidate with by a margin of 2.77%. His mismanagement of the Arar file and the Liberals’ dwindling fortunes in Quebec make exiting ‘on his own terms’ a wise move by the current Minister of Foreign Affairs. Jack Layton is trying to negotiate the excision of the $4.6 billion corporate tax cut with Prime Minister Paul Martin. Cut those corporate taxes or lose NDP support on the budget vote (a vote of confidence), Martin has been told by Layton. Let’s look at what has got Layton in a huff. Jack Layton wants the Liberals to backtrack on a 2% corporate tax cut over 5 years. 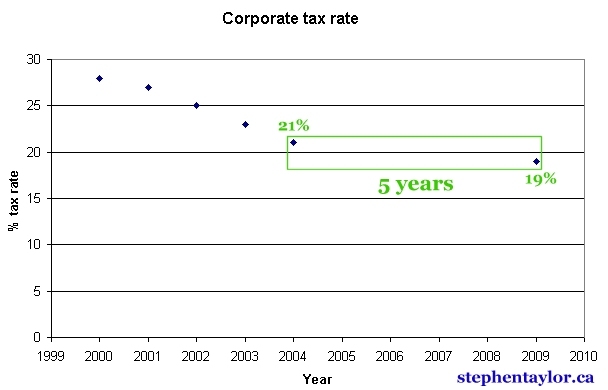 Corporate taxes have decreased 2% per year since 2001. Jack Layton wants the money reinvested into “people” and the environment. Tax cuts = Job creation. Last time I checked Jack, people like being employed. The Liberal tax cut of 2% over the next 5 years is actually quite modest given the rapid rate of decline in the corporate tax burden over the past five years. Tax relief actually keeps our small, medium and large businesses competitive with American businesses, Jack. Elimination of the corporate tax cuts would be a slap in the face to all small- and medium-sized enterprise (SME) owners who create most of the new jobs in every community across Canada. Prior to last year’s federal election, both the Liberal and NDP parties expressed support for creating a fair taxation system for small businesses in recognition of the important role it plays in economic growth and job creation. In his budget, Finance Minister Goodale proposed to end the corporate surtax in 2008 — a surtax that was introduced in 1987 to reduce the deficit that was eliminated several years ago. This measure will be especially beneficial to SME owners. Finance Minister Goodale also announced a reduction in the corporate tax rate from 21 per cent to 19 per cent by 2010 — a much needed measure to reduce Canadas tax rate disadvantage compared to the U.S.
We believe that these tax measures are far too important to be used as bargaining chips for political purposes. These measures are needed to build business confidence and certainty in the country’s economic direction and to ensure that the SME sector will continue to generate economic growth and jobs — and thereby finance Canada’s ambitious social agenda. I can’t imagine what the NDP would do if they were actually in power. The testimony of Chuck Guite is coming up later this week. Paul Coffin is also set to testify. The Gomery commission has covered both testimonies with a similar publication ban to protect a potential jury pool from becoming biased prior to the eventual trials of Chuck Guite and Paul Coffin. Will Captain’s Quarters have coverage of this secret testimony of Chuck Guite and/or that of Paul Coffin? I still find it ironic that an American blog has more freedom to inform Canadians on the details of the corruption of our own democracy than do mainstream media outlets. Will the Gomery inquiry lift the publication ban on Chuck Guite’s secret testimony or that of Paul Coffin once it is inevitably leaked on the American blog? 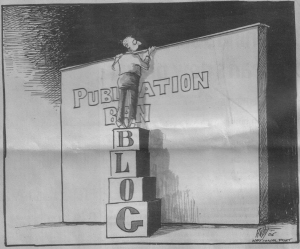 Gomery decided to lift the publication ban on Jean Brault’s testimony shortly after it hit the blogosphere. What’s the perfect way to respond to the Liberal assertion that “Canadians don’t want an election right now”? Respond with “The Liberals want to have a 10 month election campaign” of course. However, might I make a suggestion? Make it “The Liberals want to have an American style 10 month election campaign” just to rub their noses in their own filth. In what is sure to create the largest media crisis for the state broadcaster since David Kelly, the BBC was caught miking hecklers at a Conservative rally at which leader Michael Howard gave a speech. In a letter to Helen Boaden, the BBC’s director of news, Guy Black, the Conservatives’ director of communications, said that the “placed” hecklers shouted slogans that were “distracting and clearly hostile to the Conservative Party”. The slogans included “Michael Howard is a liar”, “you cant trust the Tories”, and “you can only trust Tony Blair”. Paul Martin is facing perhaps his most devastating setback yet: Bono is “annoyed” with the Liberal Prime Minister. Paul Martin has previously drawn upon the powers of rock. He did so most notably during the Liberal convention of 2003 when Bono gave his blessing to the coronation of the new Prime Minister at the Liberal leadership convention. But lately, Bono’s been upset at Martin inaction on the dedication of 0.7% of Canada’s GDP to foreign aid by 2015. What is Paul Martin doing? Paul Martin is set to address the nation tonight in a rare Prime Ministerial address that is usually reserved for times of national crisis. So, I have to ask… what is Paul Martin doing? First of all, this doesn’t look good on his part. For those that watch politics this has the optics of an act of desperation. Prime Ministers have historically reserved national addresses for times of national crisis. Is the nation facing a crisis or is this ‘crisis’ and desperation merely the aspect of turnover of a corrupt government that has finally run its course? I’m not particularly more anxious about my personal well-being than I was, say, last fall. However, I am doing my taxes next week so perhaps I’m a little miffed at where some of those dollars have been going. But crisis? No Paul, this is your crisis, not ours. Perhaps this is merely symptomatic of the Liberal mindset that the government is synonymous with the the Liberal Party, and by extension of their logic, with the people of Canada themselves. So, what is Paul Martin doing? Will he attempt to set the tone for the upcoming inevitable election? Will he take a swipe at the Conservatives? Will he try and give birth to the election issue and name it ‘healthcare’? If he does, it will fail. Canadians already know what the next election will be about and it’s not healthcare. So, what is Paul Martin doing? He has already promised to get to the bottom of the Sponsorship Scandal. One year later and here we still are. Gomery got us closer to the bottom of the pork barrel, but we’re finding that Paul’s been waiting there all along. Will he claim success? This seems absurd. He will stress that Gomery needs to finish his work. Testimony is set to wrap up soon and Martin asks that we await the judge’s verdict. Trouble for the Liberals is that we’re absolutely certain whom Gomery isn’t going to vote for in the next election. Indeed, we will all render our verdict upon the Liberal party soon enough, whether we’re “ready” or not. Speaking of being “ready” for an election… that biased media question that crept into polls and became the main Liberal talking point for the past two weeks. Ah yes, we’re not “ready” for an election. I don’t know about you, but I’ll take the half hour out of my day to vote because I don’t require much mental preparation given what we’ve been learning from the Gomery commission. In fact, it’s the Liberals that aren’t ready to face the music and lose their grip on 12 years of power. This “address” must have been planned for a while. So why do it on a Thursday? At 7:45pm? Is it really going to be that bad? While it’s best to release good news on a Tuesday before 4pm so that it can cycle through the rest of the week, bad news is usually released after 4pm on a Friday because Saturday, and indeed the weekend, commands the smallest of audiences in the news market. But this is a television address at 7:45pm on a Thursday. This timeslot commands the highest television audiences (on other networks). 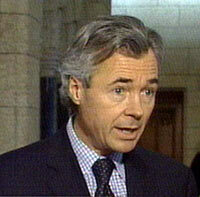 Yes, Paul Martin’s awkward address to the nation on CBC/Newsworld will be wedged between Joey, Survivor, the O.C. and C.S.I., the four most popular shows on television. If Paul Martin wanted people to watch his address, why is he starting it staggered between two television timeslots and during the Must See TV Power Hour? Is it really that bad? Or is this address merely a gesture so that people (who won’t watch it) will have the general feeling that he addressed the issues? Also, the PMO didn’t request mandatory time from the networks. He wouldn’t want to pull people away from the Immunity Challenge after all. There is no press either to be present either. Therefore, this will be a carefully crafted message without scrutiny from the press. So, what is Paul Martin doing? Is he trying to take control of the message from the news media as the PMO claims? Or is he trying to appear to be in control while hiding out on Newsworld and CPAC while Canadians watch Survivor? This is not a Prime Ministerial address. This is a muted act of desperation veiled by an image of control. Posted on April 21, 2005 Author Stephen TaylorCategories OtherLeave a comment on What is Paul Martin doing?